Why You Must Buy Home Insurance Before Closing on a Home - Shannon Insurance Agency, Inc.
Buying a home isn’t as exciting of a process as it may look like on HGTV. It involves a lot of paperwork and finances to bring you to that happy closing day. But if you haven’t purchased home insurance yet, you’d better start shopping around. For most homeowners, lenders are required to help them obtain the home of their dreams, unless you happen to have enough cash to purchase the home in full. However, if you are like most people, here’s what you need to know about buying home insurance before closing. Do I Have to Buy Home Insurance Before Closing? Just in case you are still thinking you can get out of home insurance, yes, you do have to purchase it for at least a year in order to close on your home. In order to protect their investment (your new house), lenders will require you to cover your home against disasters. Until you have paid off your mortgage, your lender as the stakeholder has the right to hold possession of your property to protect what is technically their property. Home insurance is designed to protect both you and the lender, which is why lenders typically will not agree to lend you the money for your home until they know it will be protected. 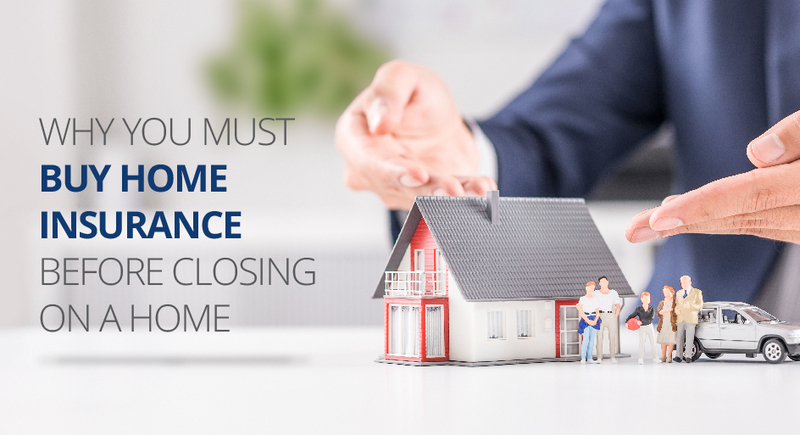 Plus, keep in mind that there are some advantages to paying homeowners insurance up front at closing, as you can sometimes exclude that premium from your closing costs. Home insurance policies can protect your physical house, your belongings on the inside, and the cost of medical expenses for a person injured on your property. The amount of coverage you need typically depends on your lender. However, the general rule is that you need enough to cover the cost of rebuilding your home from the ground up in case of disaster. By having homeowners insurance, you and the lender are protected in the event that the house is damaged or destroyed. Additional coverage can also be added such as flood or earthquake insurance, depending on your situation. Replacement-cost policy– This type of policy covers the current cost to replace your home. For example, if you were to buy an older home that has unique features, the cost to restore it may be higher. A replacement-cost policy runs about 10 percent more than a cash-value policy but will cover the cost of rebuilding. Cash-value policy– This type of policy costs less than a replacement-cost policy and covers the market value cost of your home and its contents. So rather than reimburse you the amount you paid for something, you will only get back its depreciated value amount. While some types of insurance may be optional, homeowners insurance is a must if you want to own a home. You do always have the option of finding ways to reduce your premium such as by adding security systems, storm shutters, or deadbolts. We’ll shop around for you to find the best policy with the right coverage and price. Let us know how we can help you by giving us a call today.